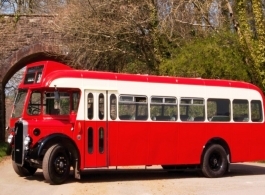 This 1947 Bristol AEC is a 35 seat vintage bus in Red and White perfect for wedding hire. The traditional and comfortable interior helps create a great atmosphere among guests while they are travelling to a wedding or other special occasion and its a great way of ensuring that everybody arrives at venues all together. Should your total number of passengers exceed the capacity of this bus we can also organise other similar style vintage buses.